The most renowned of all rocking horses is the traditional dapple grey. Our dapple grey rocking horse turns heads and wins hearts, as it brings a warmth, softness and friendliness that was missing in many originals and which is lacking in most of replicas of the dapple grey today. Liriodendron tulipifera, more widely known as tulipwood or American whitewood, is a perfect wood for the dapple. 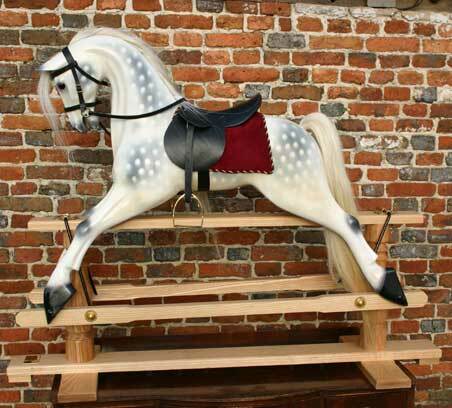 Available with a wide range of tack, style and finish, our dapple grey rocking horse is certain to appeal to all ages.